My boyfriend loves eclairs. However, I don't want to bake the same dessert over and over, it would get boring quick. 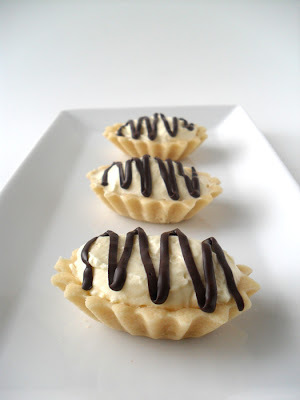 So I came up with a new dessert idea...eclair tarts! It would still taste like an eclair, but I wouldn't be baking the exact same thing. Problem solved! 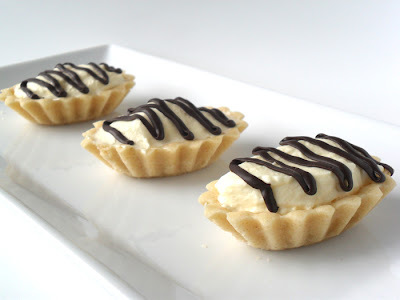 These eclair tarts were delicious. 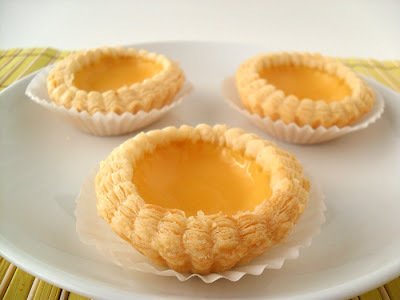 The tart shell is soft and crumbles apart gently when you bite into it. Just wonderful! I think you will enjoy eating this! For shells: Preheat oven to 325 F.
Cream butter until soft. Beat in sugar and vanilla. Then add egg yolks and beat until creamy. Gradually stir in flour until well mixed. Lightly spray tart molds with oil spray. Take about 1 tablespoon of dough and press into mold, spreading dough as thin as possible. Bake in oven for about 10 minutes. Cool and remove from tart mold. I used a toothpick to help me get them out. Fill them with the whipped vanilla filling and drizzle with chocolate glaze. For filling: Combine pudding mix and milk in medium bowl according to package directions. In a separate bowl, beat cream with an electric mixer until soft peaks form. Beat in 1//4 cup powdered sugar and vanilla. Fold whipped cream into pudding. Use filling to fill tart shells. For glaze: Combine butter, milk, corn syrup, and vanilla in a medium saucepan and heat over medium heat until butter is melted. Decrease heat to low, add the chocolate chips and whisk until melted. Turn off heat and add powdered sugar, and whisk until smooth. Drizzle over filled tart shells. 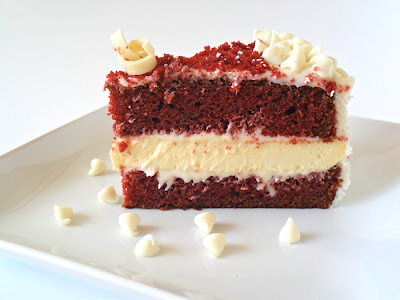 My boyfriend has been wanting to try a red velvet cheesecake for a while now. It would have red velvet cake layers with a New York cheesecake sandwiched in between. Yum! So I thought it would be an awesome baking adventure. The frosting was a tad sweet for us, next time I won't add as much powdered sugar in the frosting. We're not sugar crazy people. 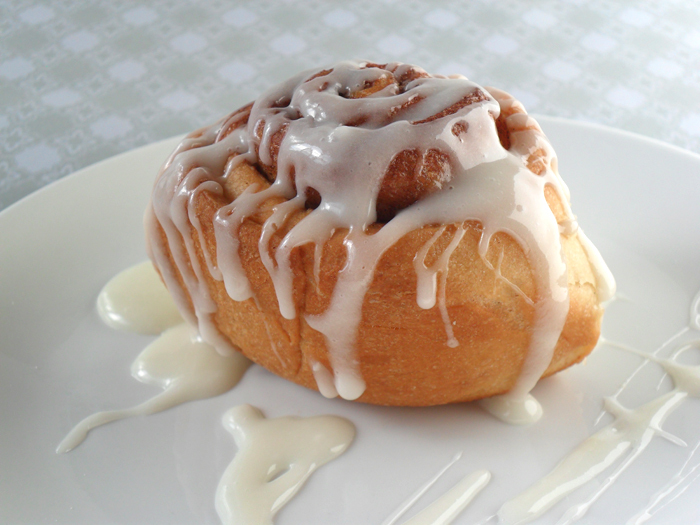 You might actually think it's the perfect sweetness. Taste and test it as you make it! Line two 9 inch spring form pans with parchment paper. Divide the batter equally between the two pans. Bake for 30-35 minutes, or until a knife comes out clean. Transfer pans to a wire rack. Allow to cool before removing the cake from the pan. Allow to cool completely before assembling with the cheesecake. I used the same recipe I used in my other cheesecakes, except I cut the recipe in half. So instead of 32 oz of cream cheese, I used 16 oz and so on for all the other ingredients. I did not have a graham cracker crust on the bottom, I instead lined it with a 9 in circular parchment paper. The recipe can be found HERE! Combine all ingredients in a large mixing bowl and beat with an electronic mixer until well combined. 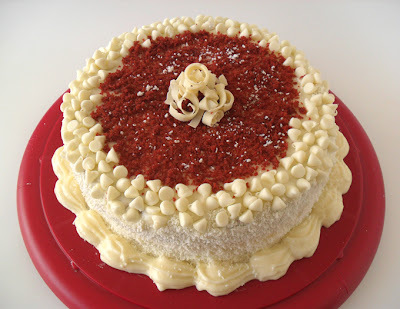 Add more powdered sugar to taste, if a more sweet frosting is preferred. Use immediately to frost the cake. I've been wanting to make cinnamon rolls for a very long time!!! I just never found the time to make the dough, wait for it to rise, roll it out, cut it up, wait for it to rise again, and then bake it. I would need a good half a day. Luckily, today is the day! 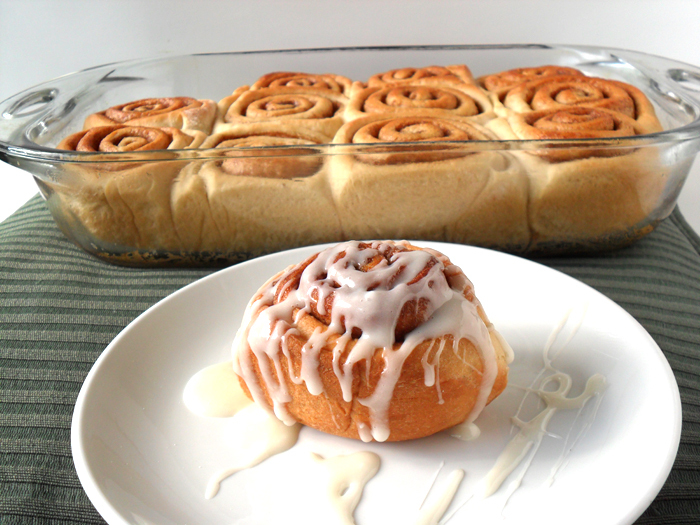 These cinnamon rolls were super delicious! Soft and all that cinnamon sugar were divine! I covered them in a cream cheese icing, oh my yum! You must try them!!! Butter a 9 by 13-inch glass baking dish. Turn the dough out onto a lightly floured work surface. Gently shape the dough into a rectangle with the long side nearest you. Roll into an 18 by 12-inch rectangle. Brush the dough with the 3/4-ounce of melted butter, leaving 1/2-inch border along the top edge. Sprinkle the filling mixture over the dough, leaving a 3/4-inch border along the top edge; gently press the filling into the dough. Beginning with the long edge nearest you, roll the dough into a tight cylinder. Firmly pinch the seam to seal and roll the cylinder seam side down. Very gently squeeze the cylinder to create even thickness. Using a serrated knife, slice the cylinder into 1 1/2-inch rolls; yielding 12 rolls. Arrange rolls cut side down in the baking dish; cover tightly with plastic wrap and let rise until dough is doubled, about 45 minutes. Preheat the oven to 350 degrees F. Bake for about 30 minutes or until nicely browned. 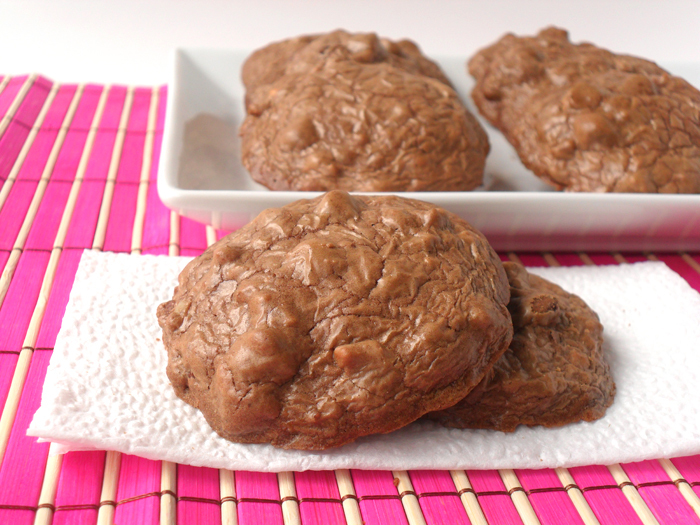 I love the combination of chocolate and coffee and these mocha nut cookies contain both chocolate and coffee! It's the perfect pick-me-up, besides tiramisu! 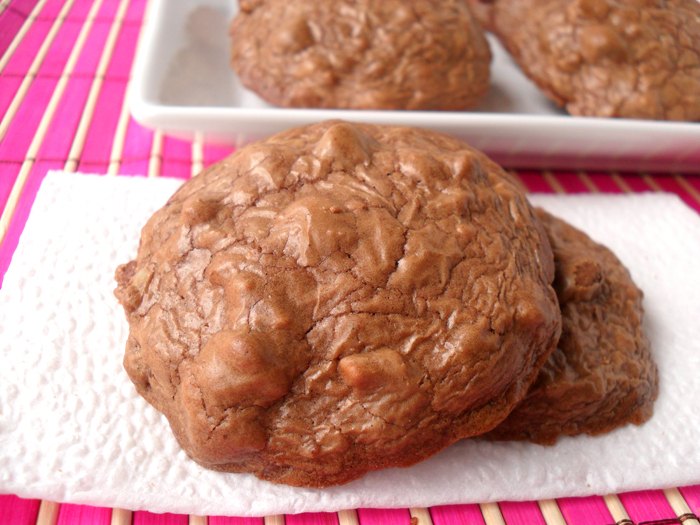 =] They also have pecans and hazelnuts in them, which gives them that needed crunchy texture I look for in a nutty cookie! I've been pretty busy last week, so I couldn't bake as much as I wanted too. But now I'm back, and I chose the perfect pick-me-up cookie to get me started again! You will enjoy these! Directions: Preheat the oven to 325 F. Line two cookie sheets with parchment paper. Mix flour, baking powder, and salt in a large bowl. Melt the chocolate and butter in a double boiler over barely simmering water. Beat the eggs and sugar in a large bowl with an electric mixer until pale and thick. Beat in the chocolate mixture, coffee granules, and vanilla. Mix in the dry flour mixture, pecans, hazelnuts, and chocolate chips. Drop tablespoons of the dough 3 inches apart onto cookie sheets. Bake until lightly cracked on top, 20 to 25 mins. 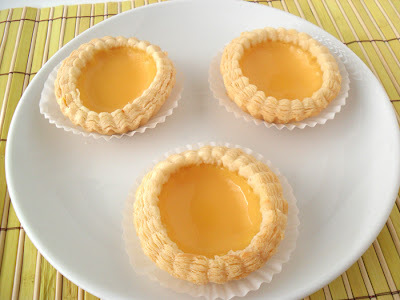 I've been looking for the perfect egg custard tart recipe for over a month now. I haven't found one...yet...but I know I will. However, I did run into one I deemed as close as possible to the egg custard tarts I have in hong kong bakeries. The crust is crumbly-flaky, but not puff pastry flaky. It is almost perfect! 1. Mix the flours, baking powder and fine sugar. 2. Sift this resulting mixture into a clean bowl and cut in the lard. 3. Mix in iced water (or pulse using a food processor) until the resulting dough forms into a ball. 4. Wrap in plastic film and let the dough relax in the refrigerator for at least 1 hour. 5. Add the baking powder into the cake flour and mix throughly. 6. Sift the flour into a cold clean bowl. 8. The paste should be close to spreading consistency but not fluid-like. 9. Place the oil dough ball in the center of the water dough circle and gently wrap up from the sides till its sealed without air pockets. 10. Lightly flour your kitchen tabletop and roll out the dough into a rectangle. 12. Make 1 extra turn at the end. 13. Measure the longest diameter of your tart mold and cut with a round cookie cutter larger than the mold by a couple of millimeters. 14. Gently and carefully line your tart mold with the cut out dough without over pressing the laminated layers. 15. The dough pastry may look as if it was too much for the tart mold, but when it bakes, the sides will creep down, so make allowance for that. 16. Poke some holes with a fork in the base of the dough. 17. Preheat your over to 200 degrees C.
18. Boil water with sugar, till all melted and keep aside till cool. 20. Add in the cooled sugar water and gently mix well. 21. Sift the entire mixture through the finest sieve you can get your hands on and into a bowl/coffee pitcher. 22. Lower the temperature of your oven to 160 degrees C and place the tart shells onto a baking sheet in the middle layer of the oven. 24. Carefully remove from the oven and let the shells cool down for about 10-15minutes. 25. Lower the oven temperature to 120 degrees C.
25. Using the coffee pitcher, carefully pour in the egg custard mixture till about 2-3mm from the brim of each tart. 27. The texture point to stop is to first look out for the egg custard to be that between creme brulee and pudding like.